At Patio Place, La Habra customers can find superior-quality, brand name patio furniture at some of the lowest prices in Orange County. Better than any limited clearance sale at a ritzy store, our showroom continuously stocks a huge selection of affordably priced patio furniture in gorgeous extruded aluminum, cast aluminum, and wicker styles, as well as fire pits, fire tables, patio umbrellas, gas logs, bar stools, barbecues, grills, outdoor fridges, kegerators, and more. We proudly carry the industry's top brands, including, Alu-Mont, Hanamint, Rattana, Sunset West, Telescope Casual, Treasure Garden, Patio Renaissance, and others. We're also the best place to go when you want to revive or repair your old, worn, or damaged patio pieces. We repair patio umbrellas, convert barbeques from propane to gas or gas to propane, replace common barbeque parts, custom replace chaise lounge slings, and produce custom protective covers. We can also replace or recover cushions and pillows of any size and shape using our huge assortment of fabrics. We offer same-day delivery to your La Habra home or business so you can enjoy your new patio furniture, fire pit, and other equipment, the same day you purchase them. To learn more, visit our showroom today at 845 Baker St., Costa Mesa, CA (between Bristol and Bear). We're open seven days a week and look forward to seeing you! For the lowest prices on brand name patio furniture in Orange County, visit Patio Place. We sell beautiful extruded aluminum, cast aluminum, and wicker patio furniture from the names La Habra home and business owners trust most: Sunset West, Patio Renaissance, Alu-Mont, and other top-reviewed brands. 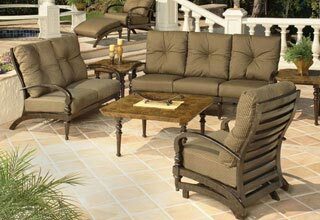 Our huge selection includes outdoor bistro sets, dining sets, and patio chair sets, as well as individual sofas, stools, tables, chaise lounges, day beds, sectionals, benches, gliders, swings, loveseats, and more. We readily provide our expert advice to our La Habra clients on everything we sell, and offer convenient, same-day delivery and set up, which includes removing and disposing of old patio furniture. 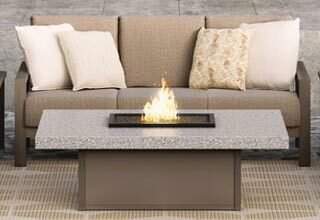 Durable, stylish, long-lasting, and affordable, our fire pits and bar stools come from Alumont, Hanamint, OW Lee, and other top brands. We sell and deliver a wide variety of fire pits, bonfire pits, fire tables, and more, all in varying heights, sizes, shapes, styles, and materials (such as metal, marble, and other stones). We also carry a large selection of beautiful bar stools which are sturdy, well-built, and available in a variety of designs, such as those that swivel; those designed with arm rests, foot rests, and back rests; etc. Visit our selection today. With discounted prices, superior customer service, and a huge selection of brand name barbeques and ceramic gas logs, we offer the best value in La Habra. Our selection includes Fire Magic barbecues, portable grills, propane barbecues, gas barbecues, barbecue island parts (including access doors, range hoods, warmers, and lights), vented gas logs, unvented gas logs, river rocks, reflective fire glass, and more. We also sell top-quality outdoor cooking equipment, such as fridges, kegerators, sinks, faucets, and more. Call us today and learn more our same-day delivery service, installation service for common BBQ parts, and other fireplace accessories, call today. Visit us today for the best deals on brand name patio umbrellas, including auto tilt umbrellas, cantilever umbrellas, easy track umbrellas, table umbrellas, push to tilt umbrellas, and side post umbrellas. 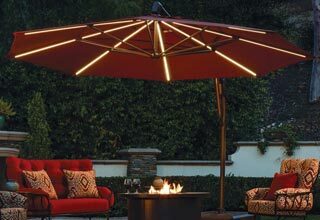 La Habra customers can count on us for a full selection of patio umbrellas. We stock outdoor umbrellas in a wide range of sizes, from 6 feet to 13 feet in diameter, and can enhance and stabilize them with stylish bases, from 50 pounds to 80 pounds. We also sell charming umbrella lights, which are available in plug-in and LED solar models. We can even personalize your La Habra patio umbrella by silkscreening your business name or logo onto it. We've helped thousands of La Habra customers restore their existing patio furniture and umbrellas to like-new condition. We can replace broken umbrella ribs, recover torn or discolored umbrellas, and replace broken umbrella strings. We can also apply a protective refinishing treatment to patio furniture frames, which can restore its original appeal. Moreover, we can custom replace outdoor cushions, slings, and pillows, and enhance them with padding or zippers for added comfort and easy cleaning. 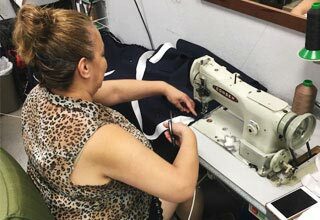 For all our fabric repairs, we use only the highest quality fabrics from Phifer, Sunbrella, and others, which are warrantied for years against damage. With 600 fabrics to choose from, we have options for every style and budget. Call today.